How to get me to give you money. It’s not by sending me your stupid donation email. Interrupting my California recap to rant and to commend. 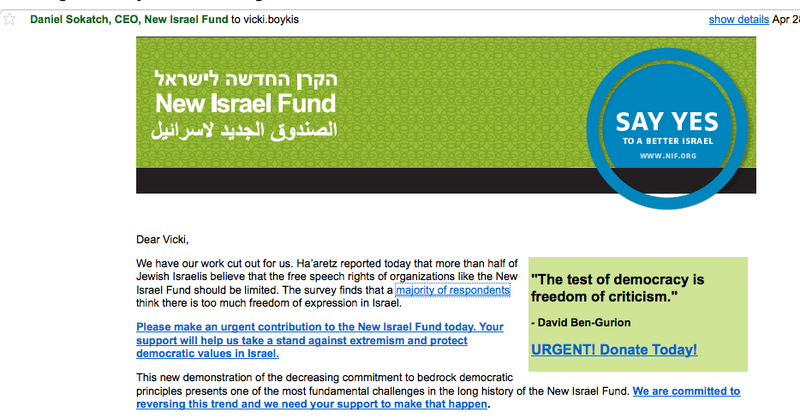 I am frequently bombarded by e-mails from Israel-related organizations that want my money either to help uphold the democratic values that Americans so value about Israel or to help poor starving children with one arm on this holiest of Jewish holidays. I delete all of them. I have donation fatigue. And I have no idea where my money is going. Yes, there is Charity Navigator for American charities. But I have no idea how effective the organizations that constantly send me e-mails are, even if I am very familiar with their work and know tons of people who work there. If they are e-mailing me constantly, they are spending less money on actual work and more on administrative tasks. Right into the trash. Why? Because I was a slave worked at Hillel on my own volition, giving the organization my blood, sweat, and tears for all of my college career (and it was great-I met the majority of my friends there). And there is no way students leave legacies behind. The people who wrote this don’t understand how campus Hillels work. They are extremely fluid and, because of administration bureaucracy, manage to make not much of an impact beyond the four years you spend there. Donations are not what makes the organization on a branch level run. Usually, funding is obtained by writing tons and tons and tons of grant applications, a process that, had I spent just a bit longer on, I would have been qualified as a grant specialist in any non-profit. 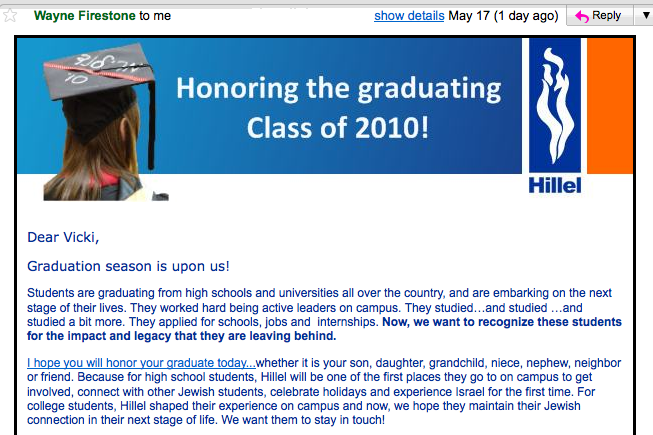 These parents that this e-mail is appealing to, however, likely don’t know this unless they also toiled at Hillel. And then there’s the JTA. 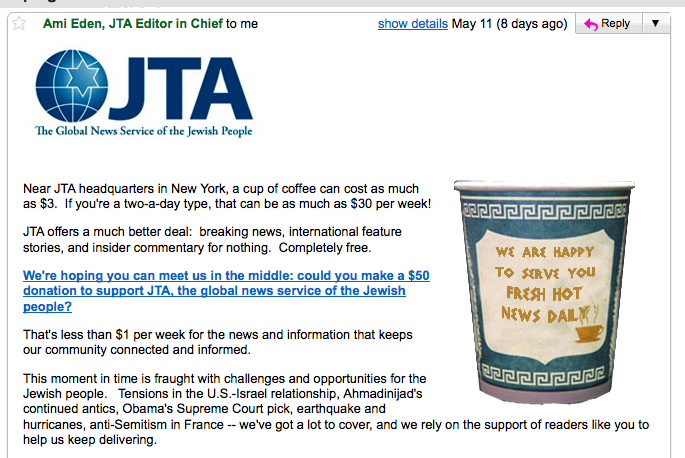 JTA, I don’t know if you realize this, but EVERY moment in time is fraught with challenges and opportunities for the Jewish people. And if I want a news update, I can get it from the Jewish Peoples’ News source: Twitter. And if that fails, there’s my mom. Stop patronizing me. Please. I delete lots and lots of these e-mails every day. These organizations are not the only guilty ones. And then, I found an effective way to give. Long time readers will recall that one of the things I like to do throughout the year is drop off the occasional hot or cold drink (depending on the season) as well as the odd bag of cake or cookies for the soldiers I pass along my daily commute. Up to this point these small gestures have been funded entirely by the ad revenue generated by this site. However, as the revenue from the sidebar ads has been, ahem, a little slow in the past couple of months… I was hoping that some of you might like to step up and join me in participating in this small, but meaningful, gesture. I sent money to him. Because I know exactly what he is doing. And he doesn’t send me beseeching and patronizing e-mails. And, actually, he probably doesn’t remember, but when I was in Israel in 2006 during the Israel-Lebanon War, he was driving t-shirts and underwear up to soldiers in the North and I emailed him asking if I could come and help and he actually called me by cell phone to tell me that my help was much-appreciated, but that he was all set. many wonderful people behind this gesture.